The MTA’s ambitious 10-year “Fast Forward” plan to modernize New York City’s transit system featuring a state-of-the-art signal system, more accessibility, a new fare payment system and thousands of new subway cars and buses. Perhaps the most ambitious part of the plan is that work previously estimated to take nearly 50 years would be completed within the next decade. But just how much would these marvelous changes improve our daily commute? Transit advocacy organization Transit Center breaks it down for a few of the city’s more sluggish examples to show us how much time we might get back to do better stuff than sit on the subway. According to Transit Center’s new analysis, if you’re traveling into the Manhattan central business district from the Bronx, Queens, or Brooklyn, you stand to regain days of your time back over the course of a year in addition to shorter wait times, speedier trains and more reliability. 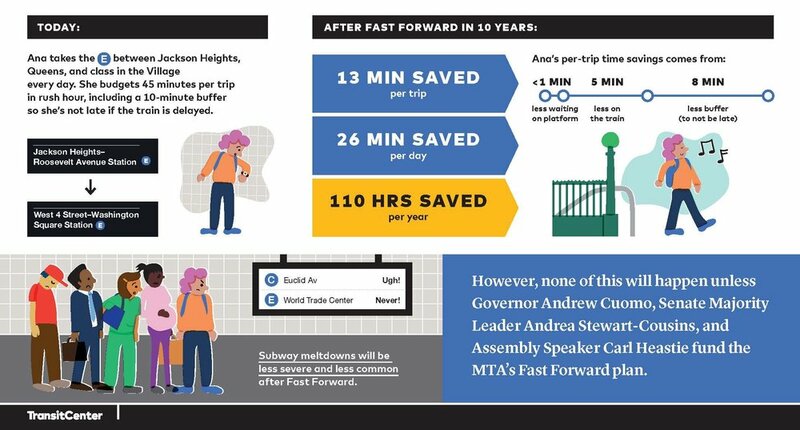 Riding from Jackson Heights to West 4th Street, for example, would save 26 minutes each day (110 hours per year). Overall the time savings for subway riders adds up to millions of hours per year. If the plan is fully funded, the MTA plans to overhaul the signal systems for substantial portions of every subway line within the next 10 years–much sooner than under the previous 40-year timeline. “Fast Forward” breaks down into two five-year plans, with the first half estimated to incur an (unofficial at this point) cost of $19 billion and the next five years to cost $18 billion. The big debate at the city and state level is, of course, how Fast Forward will be funded. The biggest potential funding source is congestion pricing–that is, having car commuters pay a congestion fee.